Looking for some design inspo? Go global with your décor by channelling the latest interiors' trend: nomadic boho. Bring a well-travelled flavour to your kitchen shelves with accessories that nod to different cultures and traditions. Introduce rich colours alongside graphic prints and mix in some lustrous utensils. And if you are struggling to find the time to trawl the souks then you can pick up all this kitchenware from George Home (we won't tell if you don't). Soft textured rugs, intricately woven rattan furniture and some form of textile on almost every surface – all of this is synonymous with the bohemian style. So go to town with the throws, cushions, rugs and wall hangings and balance it out with accents natural materials like wood and jute. Boho style embraces the ‘more is more’ philosophy, so along with having plenty of different textures, mix and match a load of patterns, too. While there are very few rules when it comes to this style, we say pick a core colour that can run through the whole room and bring the look together – get more tips from our design feature about mixing patterns and plains. Take influence from @_sare_xo’s gorgeous boho bedroom and choose a selection of hues (in this case pinks) that you can keep coming back to. 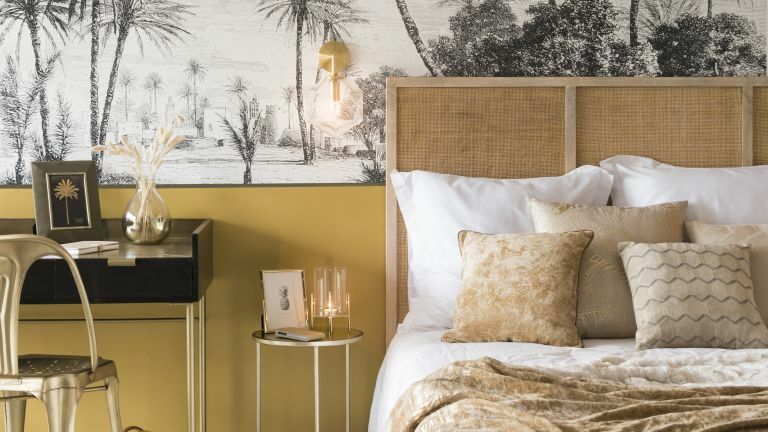 If you love the idea of going boho but the thought of painting walls anything but white brings you out in a cold sweat, then fear not, you can still get a wonderfully bohemian look entirely in neutrals. Just keep the scheme relaxed by layering up plenty of different neutral shades and adding lots of textures with throws and cushions. What we love about the boho trend is how versatile it is. You can take elements of the trend and mix it with almost any other style. Our personal favourite is boho meets Mid-century modern; there's just something about the pared back furniture and sculptural designs that give the look a fresh, modern twist. The closer to the floor you are, the closer you are to nailing boho style. Think long, low slung sofas, scattered with a ton of throw cushions, with a few neighbouring pouffes for extra seating. We get that more often than not the boho look isn’t the most practical of styles, all those billowing fabrics and layers of rugs might not be the best way to go for a kitchen or a bathroom. But that’s not to say you can’t incorporate the look in a more practical way with patterned floor tiles. These Persian tiles from Original Style add a heavy dose of bohemia in the most practical way possible. Ambient lighting makes all the difference, so rather than choose overhead lighting, opt for a few different low level light sources in the form of lanterns, floor lamps and table lights. You could of course also throw up some fairy lights just to add to the Aladdin's cave vibes. Forget about hanging pictures, instead create a textured gallery wall from fringed placemats, rattan baskets and woven discs. You can find plenty of similar wall decorations at Anthropologie. Similar jungle wallpaper at Etsy; all bedroom furniture and accessories by Maisons du Monde. Gather your clan in rooms filled with boldly patterned woven textiles – the more clashing the better – low-level seating in dusky, desert shades and metallic accents that reflect the hazy sun. Recreate this look with the James Two-seater Sofa in Brick Dust Deepest Velvet; Lucy Ottoman in Blaise Geo Shimmer and the Joan Armchair in Send Rioja Flecked Cotton, all Perch & Parrow. The terrazzo trend is everywhere at the moment and it's perfect for the boho-inspired home. Pair with wood-finished pieces and lush, leafy green house plants to create the perfect spot for urban explorers to soothe their wandering souls. Like this look? Pick up the Heja Natural Wood Mirror; Reuben Fabric Chair in Charcoal and the Nomad Grey Crewl Cushion from Argos Home. Dream of visiting exotic destinations as you sleep, cocooned among layers of textural patterns and soft fabrics. Natural materials, such as wicker and wood, serve as neutral accent pieces and a tactile transport to favourite escapes. Want to recreate this beautifully bohemian bedroom? Pick up this Macrame Cushion; Wooden Side Table; Navy Diamond Printed Double Bedlinen Set (pillowcases pictured) and Mosaic Embroidered Double Bedlinen Set at Argos (or Sainsbury's) Home. Mix and match artisanal, handcrafted ceramics in earthy colours on your table top, using rustic plates and chunky earthenware jugs to create a relaxed dining space. Wooden and glass furniture sharpen the look while keeping a natural feel. Want to create your own boho table set-up? We love this combination of the Oregan Oak Dining Chairs; Amos Glass-top Dining Table and Dining Bench; Pari Hand-beaten Gold Pendant Lightand Dandelion Rug, all Habitat. Style your living room like a travel journal with rich textures and materials inspired by adventures abroad. Blend together with talking-point pieces of furniture and make the space your passport to foreign parts.